Seeing is believing, except when you don’t believe what you see. Astronomers using NASA’s Hubble Space Telescope have found a puzzling arc of light behind an extremely massive cluster of galaxies residing 10 billion light-years away. The galactic grouping, discovered by NASA’s Spitzer Space Telescope, was observed when the universe was roughly a quarter of its current age of 13.7 billion years. The giant arc is the stretched shape of a more distant galaxy whose light is distorted by the monster cluster’s powerful gravity, an effect called gravitational lensing. The trouble is, the arc shouldn’t exist. The surprise in this Hubble observation is spotting a galaxy lensed by an extremely distant cluster. Dubbed IDCS J1426.5+3508, the cluster is the most massive found at that epoch, weighing as much as 500 trillion suns. It is 5 to 10 times larger than other clusters found at such an early time in the universe’s history. The team spotted the cluster in a search using NASA’s Spitzer Space Telescope in combination with archival optical images taken as part of the National Optical Astronomy Observatory’s Deep Wide Field Survey at the Kitt Peak National Observatory, Tucson, Ariz. The combined images allowed them to see the cluster as a grouping of very red galaxies, indicating they are far away. This unique system constitutes the most distant cluster known to “host” a giant gravitationally lensed arc. Finding this ancient gravitational arc may yield insight into how, during the first moments after the big bang, conditions were set up for the growth of hefty clusters in the early universe. 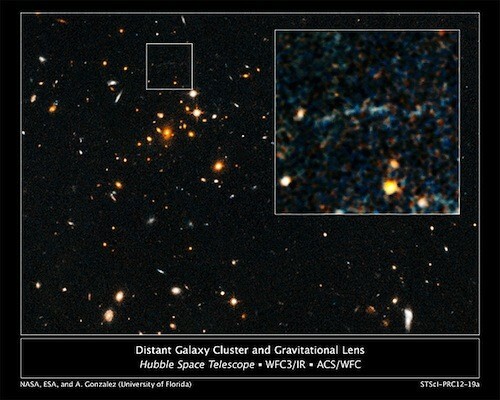 The arc was spotted in optical images of the cluster taken in 2010 by Hubble’s Advanced Camera for Surveys. The infrared capabilities of Hubble’s Wide Field Camera 3 (WFC3) helped provide a precise distance, confirming it to be one of the farthest clusters yet discovered. Once the astronomers determined the cluster’s distance, they used Hubble, the Combined Array for Research in Millimeter-wave Astronomy (CARMA) radio telescope, and NASA’s Chandra X-ray Observatory to independently show that the galactic grouping is extremely massive. CARMA helped the astronomers determine the cluster’s mass by measuring how primordial light from the big bang was affected as it passed through the extremely hot, tenuous gas that permeates the grouping. The astronomers then used the WFC3 observations to map the cluster’s mass by calculating how much cluster mass was needed to produce the gravitational arc. Chandra data, which revealed the cluster’s brightness in X-rays, was also used to measure the cluster’s mass. One explanation is that distant galaxy clusters, unlike nearby clusters, have denser concentrations of galaxies at their cores, making them better magnifying glasses. However, even if the distant cores were denser, the added bulk still should not provide enough gravitational muscle to produce the giant arc seen in Gonzalez’s observations, according to a statistical analysis.